So I recently have bought and downloaded the GOTY version of Oblivion from Steam. I was allll too familiar with the Reference Bug from the Xbox360 version, and knew the 1.2.0416 patch was necessary to fix it. I read that my Steam version already had this, confirmed by the comforting v1.2.0416 in the bottom left corner of my game. HOWEVER, lo and behold - 120+ hours into possibly my funnest, RP driven character I've ever created in Oblivion - I load up my game and ALL of my custom created gear (essentially EVERYTHING I was wearing/using) is gone from my character, right out of my inventory, right off my character. I'm playing Oblivion GOTY, no Mods, and is downloaded from Steam, WITH the Official Patch. Has anyone else experienced this?!? I thought I was safe, and now I'm terrified of playing any of my save games at all for fear of driving them into the ground and making them unplayable. It would take me 20-30 hours to even get the mats and recreate all the gear that I've already lost.
! What can I do? Help! Try loading an earlier save. If that doesn't work, cheat the items back in to your inventory or cheat in the materials and make them again. The ingame console exists for a reason. Yes, you're right I could just use the console to replace my already missing gear. That'd cut down the time to get it all back. But what I'm mainly concerned about is that if the Reference ID Bug exists on my patched game, will there be any way to avoid it? It seems like it would be inevitable to occur over and over, and I don't know how to know whether the bug is active until it's already deleted my things! What you need to do is to start using BOSS, Wrye Bash, TES4Edit, and TES4LODGen along with UOP. There is also a Oblivion DLC delayer mod. 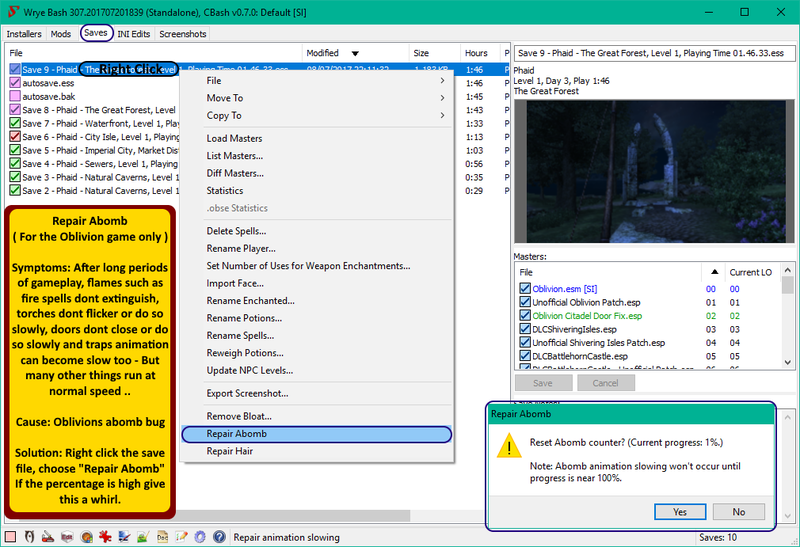 Also, using the console to correct such a thing as to get items back are not recommended to do, instead go back to an earlier gamesave just to see if that helps. I think you need to use Wrye Bash (use the last link in that post to get the latest version) in order to use the Abomb feature. @ Leonardo2 - I really appreciate your input. After clicking a few of those links and seeing your input on those pages, I see that you have good experience and great grasp on the modding side of TES games. Im sure your recommendations would lead to great results. I can also tell, that I do not have the time nor interest in pursuing such things. I purchased a game twice from a game developer and I should not need to have to waste this much time and effort to ensure it plays correctly. I assure you, there are few bigger fans of TES games as I. I have played them since I was 10 years old, and nothing even comes close. I have loved, supported, and defended elder scrolls games for literally decades. But I do not understand why such an incredible horrible, and game RUINING glitch can still exist. Mods are a great addition to TES games, they are amazing and can give the game so much more gameplay, and enrich the preexisting content. HOWEVER, I should not be FORCED to use them in order to just have a normal, vanilla, experience when playing one.